In the 1980s and early 90s, Club Med’s Chateau Royal ruled over Anse Vata Beach and introduced a generation of holiday-makers to the delights of France’s only remaining outpost of its empire in Melanesia. More enduring images of Noumea are dominated by rather mouldy, concrete apartment blocks, the murky waters off Anse Vata Beach and the Baie des Citrons, with a persistent dust haze emanating from the nickel smelter at the heart of New Caledonia’s economy. Over the intervening decades, the city’s periphery has grown, with new housing estates and shopping centres lining the northern approaches of Route Territoriale 1, but central Noumea remains rather downbeat and tired — a barren melange of concrete and steel — while local hotels remain more notable for their exorbitant prices than any real aspirations for Michelin stardom. 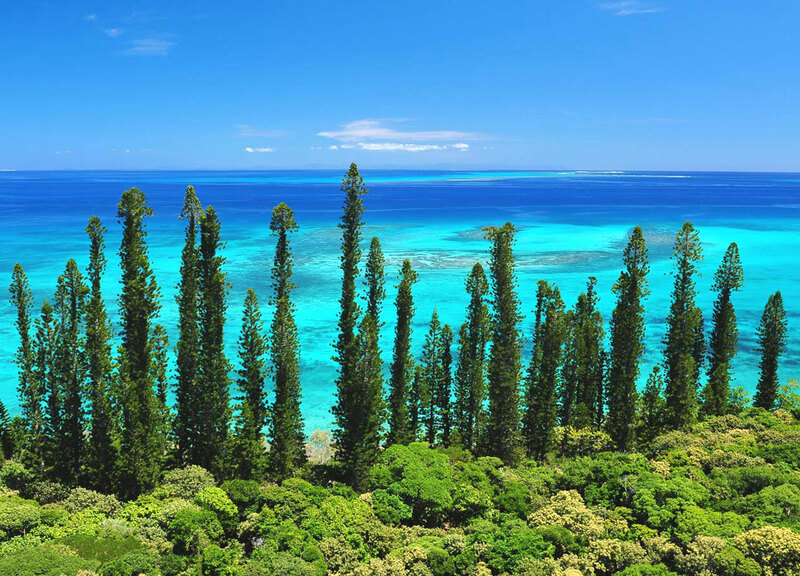 As a result, most visitors’ appreciation of New Caledonia as a whole has been largely shaped by the 40 kilometre journey from the international airport at La Tontouta to and from Noumea, with little real appreciation of what New Caledonia — as whole — has to offer. 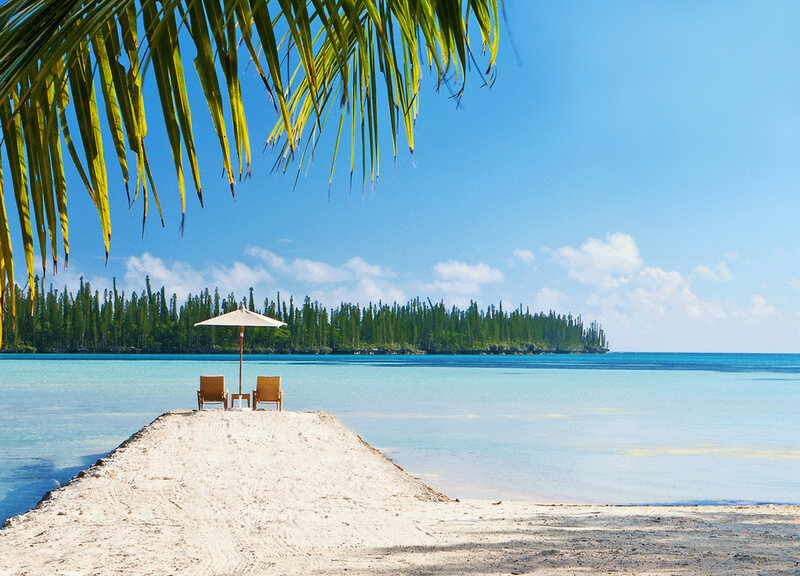 Yet, New Caledonia’s coral reef is second only in size to that of Australia’s Great Barrier Reef, its outer islands — such as Lifou and Île des Pins — are now regular highlights on the cruising calendar, and the spinal column of the Grand Terre exhibits true grandeur. 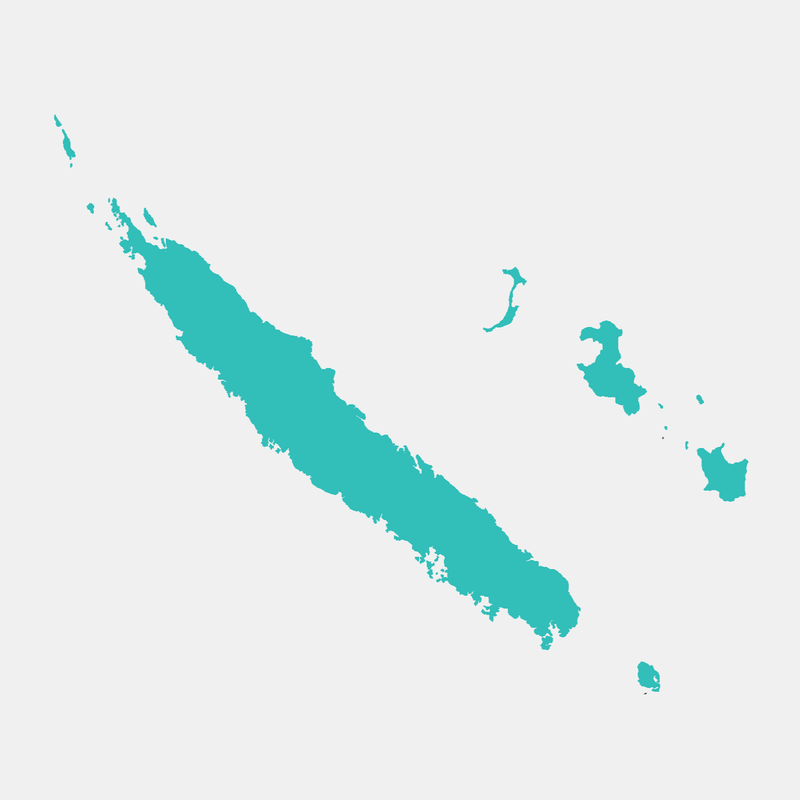 Consequently, New Caledonia offers an abundance of places to find respite from Noumea, both for its increasingly wealthy local population – enjoying a per capita GDP similar to that of Australia — and for international travellers looking for alternatives to the well-trodden paths to Fiji, Rarotonga and Vanuatu. Lookout over Oro Bay, Île des Pins, New Caledonia. 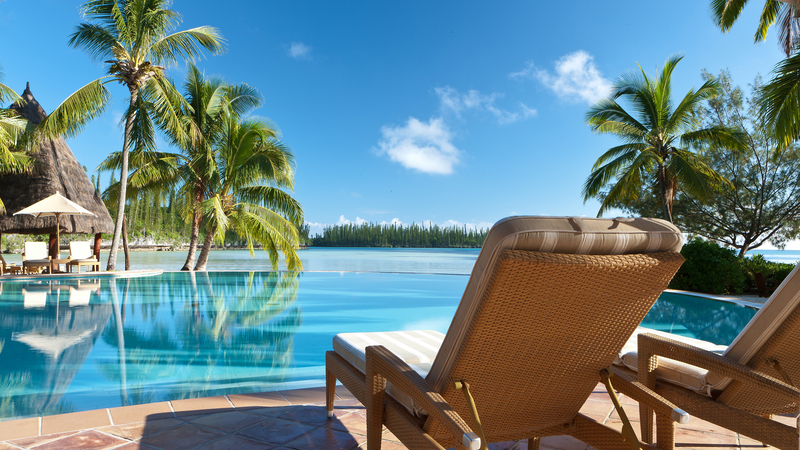 Starwood Group’s Le Méridien Île des Pins has, since 1997, been a key player in this market, occupying the quite spectacular Baie D’Oro on the eastern side of Île des Pins (or Kunie in the local Kanak language). It’s an idyllic island that marks the south-eastern edge of New Caledonia’s main barrier reef, a rich palette of spectacular white sand beaches, volcanic tefra landforms, and turquoise and azure blue waters. Our break began on Île des Pins with a rapid descent into the local airport, revealing multi-hued seas and a forest-dominated isle. 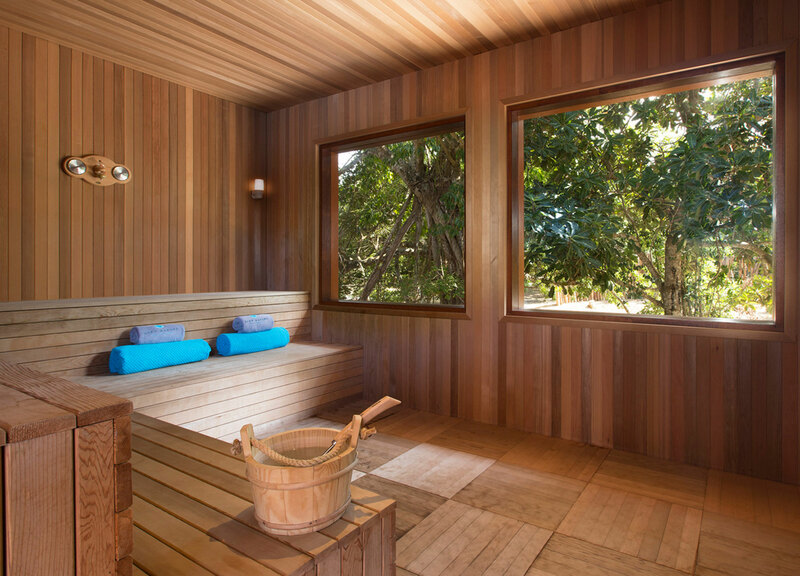 Initial impressions of Le Méridien — supported again and again by comings and goings over subsequent days — were of an intimate, modestly scaled resort that is delightfully bedded into its coastal forest and palm tree surrounds. Sitting on a small island that is separated from the rest of the Baie D’Oro by a narrow lagoon and bridge, the resort looks out to a series of flat-topped lava headlands and islands, while the beach lining the edge of the hotel offers a wonderful retreat after a glass of Number One pression or a little too much Medoc. Alternatively, launching one of the various paddle boards, canoes and pedal boats on offer allows one to experience more intimate contact with Le Méridien’s aquatic playground. By the pool at Le Méridien. And this, ultimately, is the very essence of Le Méridien: forget the spacious and appropriately decorous suites and beachside bungalows, forget the manicured gardens and beachside pool, even the langouste and other riches offered on the daily carte. Instead, just relax and luxuriate in a delightfully low-key, seaside escape from reality. Visitors may explore at their leisure the mosaic of white sand and coral between the nearby islands, catch glimpses of turtles feeding on beds of sea grass, be amazed at the millions of juvenile fish massed in the tidal stream under the entryway bridge, or loan a snorkel and mask to explore La Piscine Naturelle at the other end of the lagoon, with its fluorescent array of clams and multitude of inquisitive reef fish. For those feeling more adventurous, trips out to the reef edge offer the opportunity to stand on a sand bar — surrounded by just, well, sea — and feed stingrays, watch young sharks or appreciate the natural grace of passing manta rays. Alternatively, it is easy to gain an appreciation of the rest of Île des Pins via local tour buses, rental car or even one of the hotel’s bicycles. This rather more leisurely approach to travel around the island allowed us to explore a sequence of bays down the island’s western coastline, culminating in arrival at the spectacular Kuto Bay, with its arcing sand beaches and coral outcrops framed by volcanic headlands. Directly behind the main beach, a canopy of coral trees is spectacularly laced across the coastal road, while nearby, the remains of a local prison speak of Île des Pins’ chequered history as the ‘home’ for some 2800 deportees after the Paris Commune uprising of 1871 — evoking images of a sort of South Pacific Devil’s Island. Even so, much of our journey reinforced the island’s nickname l’ile la plus proche du paradis — ‘the closest island to Paradise’. Somewhat less appealing and enervating is the sight of most of the island’s inland terrain now largely buried beneath the sterilising rows of production pine forest. Fortunately, signs of harvesting have yet to emerge, while the island’s coastlines remain largely dominated by native forest with its much more varied textures and colour gradations. Most coastal promontories are also regularly punctuated by the highly distinctive and erect profile of Araucaria columnaris (Cook Pine) that gives Île des Pins its name, while palms lend many of the local beaches a truly tropical flavour, even during the cooler months of May to July. Returning to Le Méridien, one again feels transported to a true haven and refuge — not quite the same as the locations used in 2005 for filming of the French version of Survivor, but a world apart all the same. Some 250 kilometres northwest of Baie D’Oro, the Sheraton Deva Resort & Spa offers a contrasting experience. Nestled into the savannah landscape of Bourail between a line of steep inland hills and the barrier reef, the resort’s band of sheltering sclerophyllus forest is rapidly succeeded by the striated fairways and grassland margins of an international calibre golf course. Consequently, whereas Le Méridien is small scale and intimate, the Sheraton Deva is substantially larger and more physically imposing. The main foyer pays homage to island architecture at the Sheraton Deva Resort and Spa. 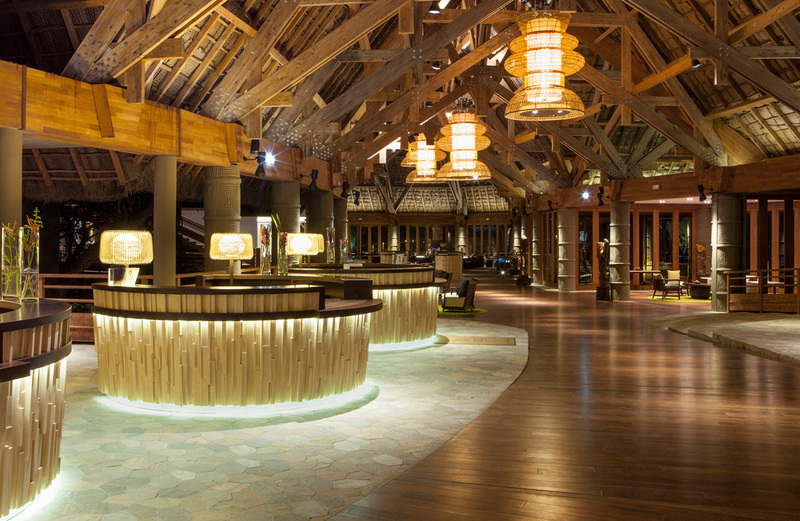 If Le Méridien is an ode to things natural, then the timber ‘cathedral’ of the Sheraton’s main foyer and public facilities pays homage to island architecture, its meandering vaulted ceiling and tiered wooden ‘chandeliers’ paving an elegant path out to the resort’s pool area and beach. 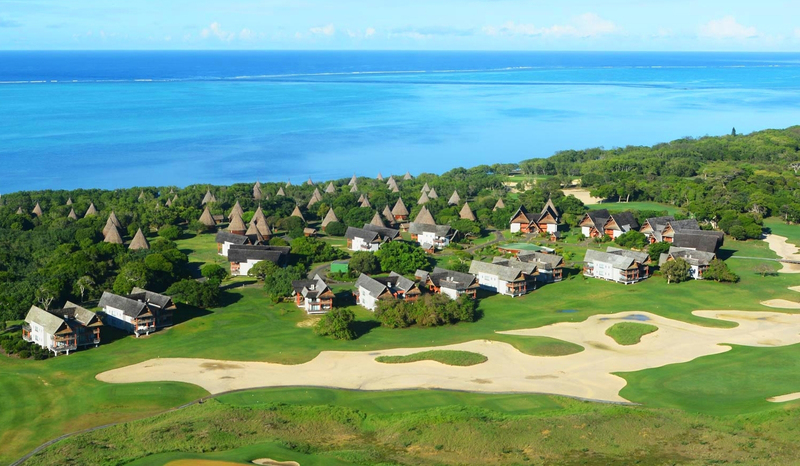 Individual bures, set amid dry eucalypt forest or tiered suites overlooking the international golf course, ooze luxury, while a seemingly endless beachfront merges seamlessly with the open expanse of New Caledonia’s coral reef. The endless roar of breakers crashing onto the outer reef creates a soundscape that both entices and soothes, while the artfully manicured fairways of the golf course offer a quite different form of enticement and challenge. In a word, the Sheraton Deva is about pampering: spa sessions of every variety up to two hours long, a jacuzzi built into the main pool, a golf course that is long enough to require the use of buggies, leisurely walks in the hill country behind the resort, and huge weekend buffets that traverse a wide array of epicurean tastes offer plenty of opportunity to feel totally relaxed and replete. On the other hand, a broad array of excursions also offer the opportunity to live a little more ‘on the wild side’. The Deep Nature Spa and sauna at the Sheraton Deva Resort and Spa. 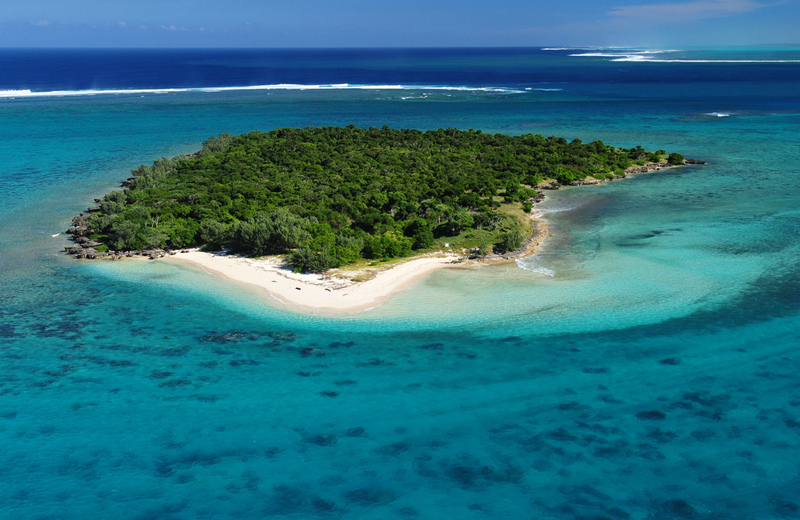 We decided on a trip to Île Verte — Green Island — near the outer edge of the barrier reef. With scarcely a cloud in the sky, the colours of its massed coral heads were starkly revealed, from the lime green petals of an unfolding coral ‘lettuce’ to the blue-hued prongs of massed stands of stag horn coral. In between a constant parade of brightly coloured parrot- and clownfish, rather more fleshy ‘Napoleons’ repeatedly intercepted our meandering course across the reef, while schools of pelagic species were noticeably more circumspect. In the shallow waters of Île Verte, children and parents alike delighted in feeding a varied swarm of fish that flashed their silver, turquoise and yellow colours in the clear sunlight. 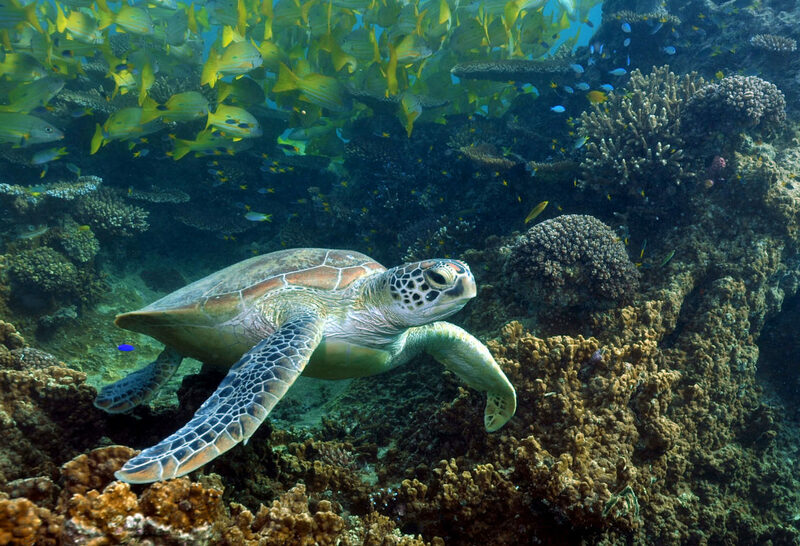 Others talked of seeing turtles feeding directly off the Sheraton’s beachfront from its glass bottom boat. However, our interaction with these gentle creatures was largely confined to watching them anxiously watch us right back, before diving away with a flick of their powerful flippers. 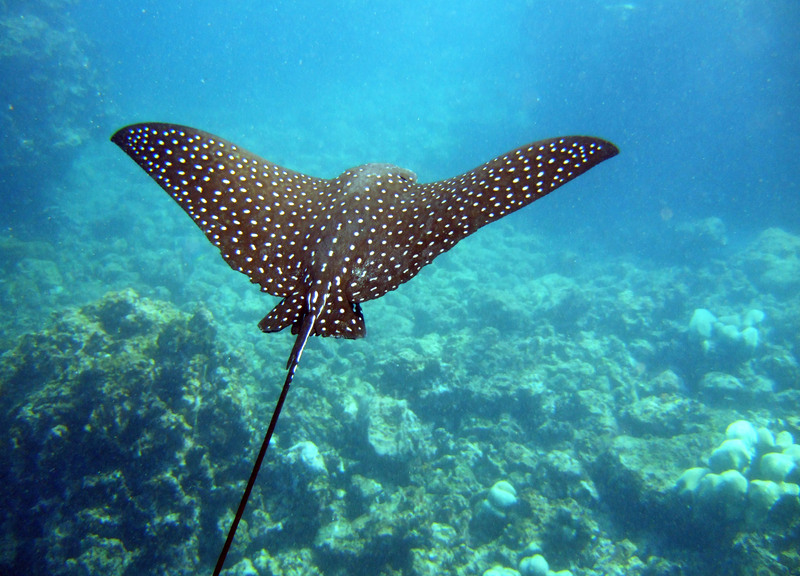 Even so, with several nesting areas close to Bourail, they remain a common sight for most reef visitors. One of our tour guides also thought that he saw a dugong, though no-one else could confirm his sighting of these shy — and increasing rare — creatures. A sea turtle glides by, directly off the Sheraton’s beachfront. Returning to the Sheraton, the welcoming loungers around the swimming pool and jacuzzi became our target of choice, although a brief foray onto the golf course produced lots of sweat, frustration, blisters — and a golf card that was fortunately unintelligible by the round’s end. An international amateur tournament had finished the day before and I was thankful that the spectators were well and truly gone. By now, our brief sojourn in New Caledonia was drawing to a close and our evening walks along the Deva’s beachfront — watching the sun’s descent, as a burning red ball, to the western horizon — were tinged with the reality of imminent return to normality. Looking out across the flat calm of the near sea, fish tails would periodically emerge as their owners scavenged the shallow littoral floor, while the sight of an occasional dorsal fin speeding across the technicolour plane of the sea marked undersea chases of indeterminate origin and outcome. Ocean view from the Îsle of Pines in New Caledonia. We realised that both Le Méridien and the Sheraton Deva offer very real alternatives to the more recognised ‘escapes’ afforded by more well known South Pacific climes. Both have some of that ineffable magic that seems to come from the blend of both French and local — in this case Kanak — cultures. Just as important, both resorts make the most of truly wonderful locations for that special getaway experience.Le Méridien Île des Pins is imbued with a wonderful sense of intimacy and seclusion amid the spectacle of Baie D’Oro, and even though the Sheraton Deva relies more on its built environment to frame its escape experience, it nevertheless affords ready access to a truly amazing and diverse maritime environment. Both are well worth a visit — or two.